CBSE UGC NET Nov 2017 Notification, Eligibility, Exam Dates, Apply Online at cbsenet.nic.in. Central Board of Secondary Education (CBSE) has released the UGC NET (Union Grants Commission National Eligibility Test) Notification November 2017. A large number of aspirants might be waiting for CBSE UGC NET Notification 2017 to apply for the test. Candidates seeking to apply can check the details of CBSE UGC NET eligibility criteria, application process, application fee, and exam dates from the following article. It is notified that CBSE will conduct the next UGC-NET for Junior Research Fellowship & Eligibility for Assistant Professor on 05th November, 2017 (Sunday). The candidates who desire to appear in the test may see the detailed notification available on the website http://cbsenet.nic.in from 4th August, 2017. The candidates are required to apply online from 11th August, 2017. The last date for applying online is 11th September, 2017 and fee can be paid up to 12th September, 2017. Central Board of Secondary Education (CBSE) annually releases National Eligibility Test (NET) examination for Assistant Professor or Junior Research Fellowship (JRF) in India Universities as well as in top colleges. Candidates qualified in this examination can get the job in Government, Private, and aided colleges across India. Based on the NET rank and score the priority will be given by the concerning authorities. The National Eligibility Test will be conducted in 94 cities across India. There will be 80 subjects and the participants can apply for their interesting subject and can write the examination. Eligible aspirants can apply through online from UGC NET Official portal, cbsenet.nic.in. Interested hopefuls can send their applications from 11th August to 11th September. Also, candidates need to pay the requisite application fee during this time. Applicants will have the NET examination on 5th November 2017. Aspirants those have completed the Master’s Degree in any specialization can apply for UGC NET Examination. Also, the age limit for applicants is minimum 28 years and there no maximum limit. Aspirants who score 55% of marks in CBSE UGC NET Examination are said to be qualified in the test. Candidates qualified the NET examination can get the post of Assistant Professor or Junior Research Fellowship (JRF) in India Universities as well as in top colleges. Check the application fee, application process, application fee, and other details from here below. 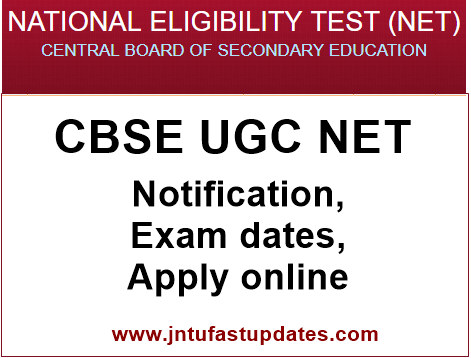 Candidates willing to apply for CBSE UGC NET 2017 can Download NET July Notification 2017 from the official website, cbsenet.nic.in and check more details from the official notification before going to apply for the NET examination. Also, applicants can check the important guidelines from the notification. Candidates have to pay the application fee through online using any debit/credit card. when will be ugc net will be conducted in the year 2018?